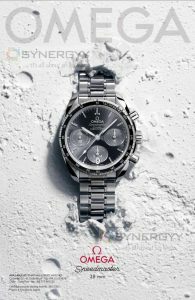 The OMEGA Speedmaster is one of the most recognised chronographs in the world. For the refined 38 mm collection, OMEGA has famous look and heritage, but the enduring design has been given a unique aesthetic touch with simplicity, size and colour in mind. The Speedmaster 38 mm collection is so extensive, you’re sure to find a watch in your favourite colour. One model, nicknamed “Cappuccino”, is made from stainless steel and 18K Sedna gold. It features an attractive bi-colour dial while the strap has been made from taupe-brown leather. A striking blend of aluminium and 18K yellow gold is just one option in a brilliant line-up of bezels. Metallic purity can be chosen alone or alongside the dazzling elegance of diamonds. It is clear to see that each Speedmaster 38 mm model includes horizontal oval subdials and a vertical oval date window at 6 o’clock. Inspiration for this design comes from the oval subdials that OMEGA used in the past on several of its De Ville timepieces. The famous Seahorse medallion on the caseback of each model is a nod to the Speedmaster’s rich history. Driving it forward is a movement of quality and reliability: the OMEGA Calibre 3330. The complete Speedmaster 38 mm collection embraces a diverse range of different materials and colours. With models for both men and women, you are sure to find a piece that matches your own personal style.